A new month, a new hospital. Yesterday I was (slightly) complaining about my upcoming commute from our new home. After today, a 10-12 km one-way commute seems like peanuts. Thank goodness it was broken up over the course of the day, but it was likely the spinning class that had me sore by lunch. I decided to make Sunday my rest day from the gym to give me a fresh start on Monday. While Rob went to a spinning class, I was in the kitchen making this high-protein alfredo sauce with white beans, soy milk and roasted cauliflower. I bookmarked the original recipe from Jess but finally made it after Johanna also had success. My changes were roasting the cauliflower, onion and garlic with some hazelnut oil and combining that with the beans and soy milk. The lemon juice, miso, nutritional yeast and smoked paprika added extra flavour that worked well with the simple additions of baby spinach and sun-dried tomatoes to the sauce. This is a nice, comforting creamy dish. Creamy in the non-oily, non-heavy, guiltless sense, though. Perfecto! I tossed this with kelp noodles, but feel free to use your favourite pasta. Two years ago, I never would have thought I would be doing commutes like this. When I started biking to work, my (one-way) commute was 4 km. Because I was essentially sedentary, I thought that was far. When I switched to a downtown hospital, my commute was 7 km, at most. When I moved out East with Rob, my commute was 8 km. When I move out West, it will be 10-12 km depending on the hospital. Having the gradual increase in distance has made this become second nature, instead of daunting. It is definitely my preferred way of traversing the city – a fun way to exercise, a great way to de-stress, faster than transit, and better for the environment. Jen recently shared this fun pic about commuting with me, which definitely reinforces why I don’t drive a car to work. With all this cycling, I imagine I will be ready for our cycle to Niagara Falls in no time, although I am trying to figure out a better way to combine my time at the gym and commuting to work so I am not on my bike 2 hours every day! This is my submission to this week’s Presto Pasta Nights, hosted by Ruth, to this week’s Weekend Wellness, to this week’s Potluck Party with high-protein vegan meals, this week’s Virtual Vegan Potluck Linky, and to this month’s Bookmarked Recipes. freshly ground black pepper, lots! 1. Preheat oven to 400F. In a large bowl, mix together the chopped cauliflower, onion and garlic. Toss with hazelnut oil and sprinkle with salt. Place in a single layer on a silpat-lined baking sheet. Roast at 400F for 45-60 minutes, until tender. 2. Once the cauliflower is cooked, transfer to a blender along with the cooked white beans, broth, almond milk, nutritional yeast flakes, lemon juice, miso, smoked paprika and freshly ground black pepper. Blend until smooth and creamy. Adjust the consistency by adding more milk or broth. Season to taste. Set aside until needed. 3. Meanwhile, cook your pasta and then drain. For kelp noodles, just rinse and drain. Set aside until needed. 4. In a large frypan, place 1/4 cup water. Bring up to medium-heat. Once boiling, add your spinach and stir until it is wilted, around 1-2 minutes. Add the sun-dried tomatoes and stir. If anything sticks, add more water. You are basically steaming the greens. Add your cauliflower sauce (you might not need the entire recipe) and heat mixture if it has cooled too much. Toss with pasta, season to taste and serve. Store extra sauce in the fridge. You must be incredibly fit. I admire that, but don’t envy those commutes! Finally–a healthy alfredo sauce recipe. Lovely. I love using miso paste, never thought about making a creamy alfredo sauce! This sounds great, thanks for the recipe! You cycle on your way to cycling? Wow, I’m impressed. I would love to own a bike, it would definitely increase my fitness level and decrease my use of public transportation. Something I need to look into. 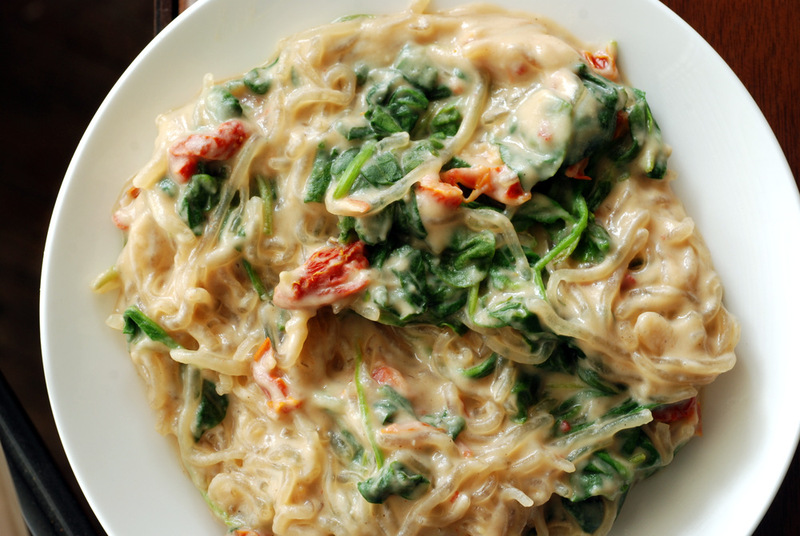 This is a beautiful spin on alfredo sauce, it sounds and looks divine! Go you, biking to work! I used to have an 11-mile round trip bike commute, with occasional 25-mile round trips to another office. Everyone thought I was insane (hopefully in a good way) to take on the 25 miles–and I certainly went through far more food those weeks! High protein & exercise for the win! You can do it! It does take a lot of energy to do both a bike commute and the gym, though. Maybe ease into it by doing one or two days per week of both commute & gym? Wow, that is quite the commute! I’m quite sure my legs would have fallen off after only the first section (if I even made it that far). I don’t own a bike because riding on the roads scares me, but I’m always jealous of the people that do commute that way! This pasta sauce looks so good – I don’t think I’ve ever seen such a healthy alfredo sauce! Whoa that is a LOT of biking! If I were you, I’d be exhausted all the time! I’ve been craving a creamy pasta sauce but don’t want to give in…this is healthy and tasty enough to make it worth my while. i remembered jess’s alfredo when i read the post title.. loved jess’s version and this with the kelp is definitely perfect for anytime. Wow! That’s some bike riding! I’m tired just thinking of it. But what a great reward… the pasta looks awesome. Thanks for sharing with Presto Pasta Nights. Awesome pasta dish. Love all the layering of flavors. Hopefully the commute will grow on you as you get used to it. I’ve biked to work nearly every day for 5 years, about 10 km each way, and my commute is often the highlight of my day. So much more pleasant than sitting in a car in traffic. Wow this defo looks great, my eldest hates anything green but the creamy sauce may just wing it! This is totally going on my list of things to make. Looks so yummy! Why do I never see any comments on how the dish actually tastes after readers tried it? All I ever read is how good the dish looks or unrelated comments. Oooh this looks SO GOOD! 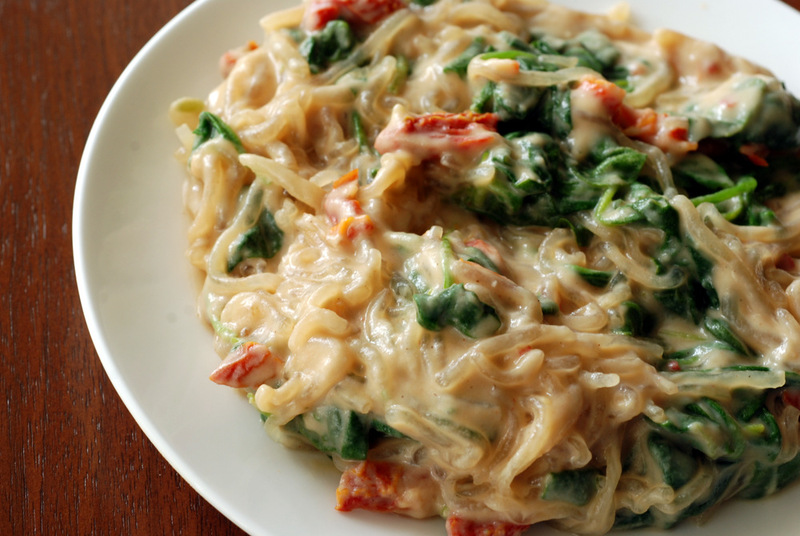 Love the use of kelp noodles. And creaminess from cauliflower huh? I haven’t tried that yet. Thanks so much for sharing it over at Healthy Vegan Fridays – it’s going to be featured this week. I appreciate your contributions Janet! I have pinned this on the Pinterest board too. Oh man! I saw this on a fellow bloggers page and will definitely be on my cooking bucket list!